Toronto is hosting two relatively high profile events in the next several years – World Pride in 2014 and the Pan Am Games the following year. While construction projects in and around Toronto abound for the Pan Am Games, World Pride is mostly centred in and around the Church and Wellesley community. Because of this, the 519 is using World Pride as a motivator for revitalizing the Church Street corridor. They have put together a very interesting Village Study with some bold concepts for making sure the neighbourhood stands out during these two events. 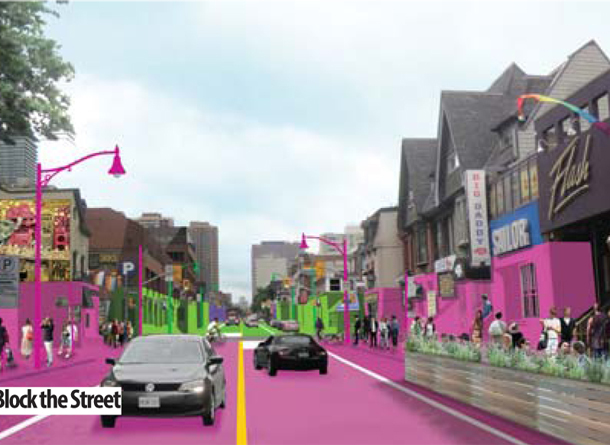 One proposal for the $1M fundraising campaign even includes colour blocking the streetscape as seen in the included pictures. Click here to read about the 8 pillar plan, which includes creation of a cultural corridor and a pedestrian-first streetscape. It’s an ambitious project but one that could result in a community that remains vibrant, well-scaled and affordable.